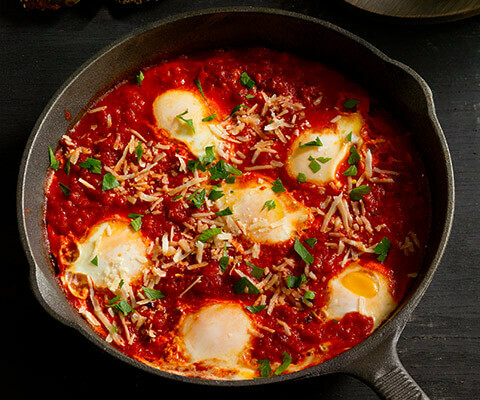 Pour Classico® Riserva Spicy Arribiatta Sauce into large skillet and bring to a light simmer (for an extra spicy dish, sprinkle additional crushed red pepper into the sauce). Gently crack eggs and add to the pan, season with salt and pepper. Cover and cook over medium heat, 8-10 minutes or egg whites are set. Sprinkle with grated parmesan and fresh parsley. Serve with toasted Italian bread and enjoy! It is delicious but yo can add Italian sausage and green peppers. Should have Italian bread. You can just add seasoning and basil if you don't want it spicy. Also makes a great topping over pasta! This is a very old Italian way of making eggs and is often served over pasta working well with any of Classico's sauces as desired. You can also add pre-cooked sausage and/or slice however much summer squash or zucchini into the sauce allowing them to soften for about 5 minutes before cracking the eggs into it and cooking to completion. 'Glad to see this featured in Classico's recipe lineup! I had never had anything like this, but having some soon to code out eggs and a jar of Classico Riserva Spicy Arribiatta Sauce, I thought I would give it a try. What a pleasant surprise it was...fast, easy, and most importantly, DELICIUOUS! This is most likely going to become a at least monthly meal for me!